Located in a “Liberty” building in a premium location in downtown Lecce, the Urban Oasis Hostel is 500m from the central station and within walking distance of most major attractions. With a bus stop right around the corner, you will find this a perfect base for setting out to explore the region -- including the most beautiful beaches of the Salento, Gallipoli, Otranto, and more. 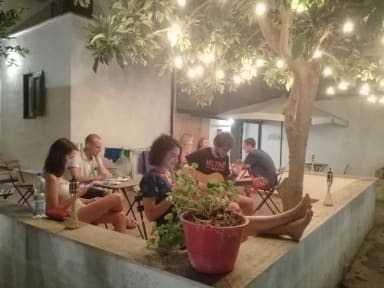 The Urban Oasis Hostel is in an ideal location for those looking to explore Lecce’s culture on foot; it is convenient to nightlife, shopping and the historical sites of Sant Oronzo Square, Duomo Square and Basilica di Santa Croce. We offer brightly decorated and simply furnished, our mixed/shared dorms are light and open rooms that can accommodate four, five, or six people. All beds come with a private reading lamp, white bed linen and cosy blankets and pillows. Each bed has its own locker for personal belongings. The rooms have “royal” vaulted ceilings and antique decorated tiled floors. Room options include ensuite or shared bathroom. Check in from 14:00 to 20:00. Really great hostel ! The garden is beautiful, shoutout to the cats !! 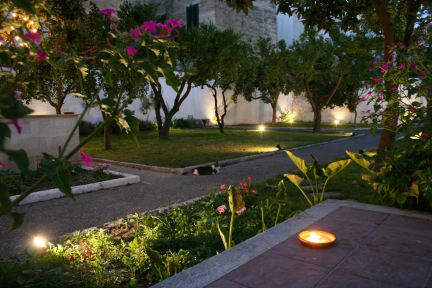 It's a very very nice place and definitely the best to stay in Lecce ! It's so great that there's a hostel in a little city like Lecce. Makes it possible for travellers to travel cheap and socialize. I only stayed one night but I met some good people and had a great time sitting outside in the garden, eating and chatting. Staff are really friendly and helpful. No complains. Everything was great, I was here in February so there was only ever three people in the room at a time. It’s clean and walking distance from the train station and city center. The staff was very helpful also! The small lockers in the room are pointless cause each key opens each locker, but there are good lockers in the lobby area that I used for my computer. Would recommend staying here! Urban Oasis Hostel was the best. Amazing and incredibly helpful people, great space and really clean and delightful in every way. I cannot recommend it more strongly. It was just wonderful. The hostel is lovely, with nice facilities, a good location and extremely helpful staff, ready to help with any questions I had. I really cannot stress that enough. But maybe because I was staying the January, there just wasn't a good vibe in the hostel. But other than, that, very nice. A very nicely decorated hostel. I found the staff to be polite, but not the most friendly/helpful of all of the hostels I’ve stayed in. Some information about the local area during check in would have been greatly appreciated. Facilities were very good and the hostel was clean. Not much of an atmosphere that I’d noticed, but that can’t be helped sometimes. Would stay here again. Located very close to old town.